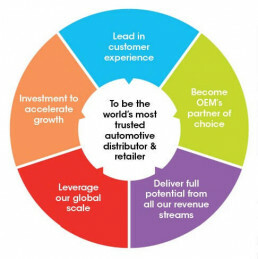 We will invest to maintain our position as leader in customer service innovation in automotive distribution and retail, with digital a key priority. Through a programme of global research, we will build on our insights into the customer journey in an omnichannel world and create stand-out customer experiences combining data-driven personalisation with a human touch. We will increase our management focus on our Used vehicle and Aftersales activities at all levels of the organisation, enhancing their perceived status within the business and deepening further reporting and analysis. We will more actively seek business development opportunities, sharpening our emphasis on building our brand and USPs in these areas to match our profile in New vehicle sales. We will allocate more resources to innovation, sharing and benefiting even more effectively from the proven ideas generated throughout the global organisation. We will sharpen further our business processes, management skills, creativity and strategic planning across the Group, focusing on talent management and shared services to boost performance and reduce costs. And we will leverage our unique competitive advantage to develop and grow our proposition in new, emerging and developed markets. We have increased our business development resources to ensure we have the management capabilities to participate in industry consolidation. Furthermore we will involve the CEOs of our market-specific operations, and leverage their knowledge and insight more directly in delivering our growth agenda.